Eat Cake, Pack of 3 [C8735] - $18.00 : Yarn Tree, Your wholesale source for cross stitch supplies. Cross stitch pattern by Sue Hillis Designs. The taste of the sweet cake with divine layers of whipped cream & fresh strawberries. "The more you weigh, the harder you are to kidnap. 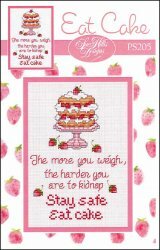 Stay safe & eat cake," is stitched underneath the strawberry shortcake. Dessert tonight calls for a piece of cake, what do you think? Stitch count 62w x 91h.